Twenty-four of the world’s most renowned musicians share incredibly candid, in-depth thoughts on the joy and pain of the creative process, their careers and aspirations, conflicts and collaborations, and the realities of today’s music business in Innerviews: Music Without Borders, the first book by Anil Prasad. The eBook edition hit #1 on iTunes' Arts & Entertainment and Music charts. iTunes also named it a "New and Notable Book," as well as a "Best Under $5" pick. The eBook also charted in the top 20 music books at Amazon UK, and the top 30 at Amazon US. Artists featured in the book include some of the greatest names in jazz, rock, world music, hip-hop, and electronica: Jon Anderson, Björk, Bill Bruford, Martin Carthy, Stanley Clarke, Chuck D, Ani DiFranco, Béla Fleck, Michael Hedges, Jonas Hellborg, Zakir Hussain, Leo Kottke, Bill Laswell, John McLaughlin, Noa, David Sylvian, Tangerine Dream, David Torn, Ralph Towner, McCoy Tyner, Eberhard Weber, Chris Whitley, Victor Wooten, and Joe Zawinul. Wooten contributes a foreword to the book. The eBook is available as a free download and may be shared and retransmitted under a Creative Commons Attribution, No Derivatives license. The files are easy to install and should be dragged directly into the Kindle app, iTunes or Acrobat Reader. Signed print copies are also available at the Innerviews store. "Thoughtful and literate music writing." 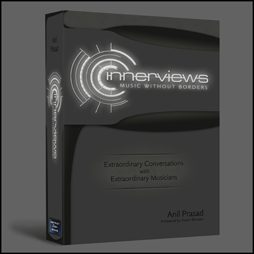 “Anil Prasad's Innerviews: Music Without Borders, is one of the most fascinating reads on the creative process of some of the most exciting contemporary musicians working today. Those who love individualistic, genre-smashing artists will cherish each and every one of these interviews and perhaps be introduced to new music that they will glad to hear for the first time. In a period when culture seems to be all about reality TV, and fame for doing nothing, a book that exposes and digs into truly creative people, with deep wells of desire to communicate in a highly personal matter, is a light shining in the darkness of the mediocrity that surrounds us today." "I'm always glad to read Anil's pieces—consistently among the best interviews out there. He always ask the right things. I'm very grateful to him."